The Oxygen Cylinder Bracket comes with two 4” clips to securely hold a D-size oxygen cylinder. Durable green powder coated steel clips, backplate, and footplate come with the bracket. Multiple sets of countersunk holes allow the bracket assembly to flush mountto any surface and gives multiple positioning for the clips and footplate. A Velcro safetystrap comes with each bracket. 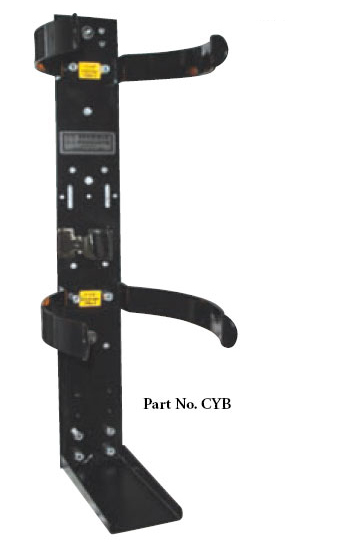 The Oxygen Cylinder Bracket has two 4.00″ clips to securely hold a D-size oxygen cylinder. Durable green powder coated steel clips, backplate and footplate. Multiple sets of countersunk holes allow the bracket assembly to flush mount to any surface and gives multiple positioning for the clips and the footplate. A Velcro safety strap in attached to each bracket.